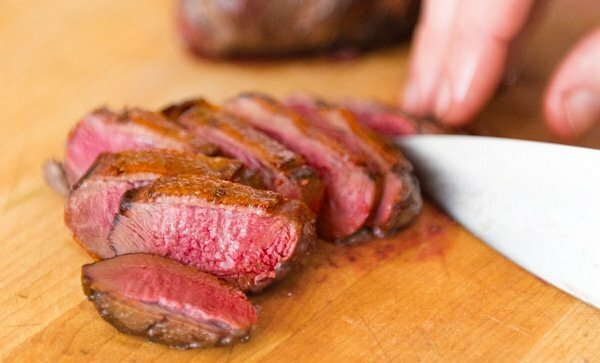 I get a lot of requests for simple wild game cookery tasks, and one of the most common requests is for step-by-step instructions on how to sear a duck or goose breast properly. I know, many of you are thinking, “I know how to do this already, Hank.” To you I apologize; what’s more, my method is idiosyncratic and is likely to be different from yours — but it works. For the rest of you, here goes. Be sure to have breasts with skin on them. Skinless breasts require a different set of instructions. 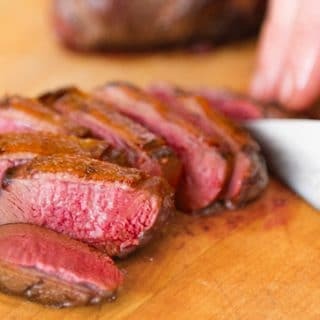 I go over those instructions in my cookbook on cooking ducks and geese, Duck, Duck, Goose: Recipes and Techniques for Cooking Waterfowl, Both Wild and Domesticated. 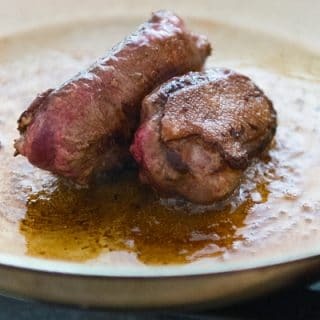 If you want more than just salt as your seasoning for your duck breast, here are some of my wild game sauce recipes. And I have an entire page of duck breast recipes, most of which use this technique. Cooking duck breasts is easy once you get the hang of it. This recipe works with any duck or goose breast, wild or store-bought. STEP ONE: Take the meat from the fridge. If you are using a domestic duck or a very fat wild duck, score the skin (but not the meat) in a cross-hatch pattern, making the cross-hatches about 1/2 inch across; this helps the fat render and will give you a crispier skin. Salt it well on both sides, then let it stand on a cutting board or some such for at least 15 minutes and up to 45 minutes for a goose breast. It is far easier to control the internal temperature with a room-temperature breast than an ice-cold one. STEP TWO: Pat the duck breasts dry with paper towels. 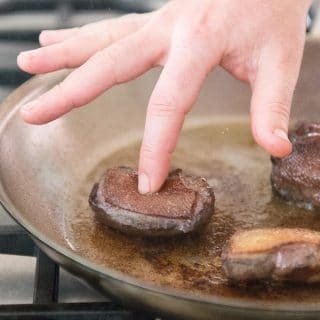 If you are cooking a domestic duck or a very fat wild duck, put 1 teaspoon of duck fat or cooking oil in a large pan; don't use non-stick pans, as they don't allow you to sear meat as well as steel or cast iron. Lay the breasts skin side down and use them to smear the fat all over the surface of the pan. Turn the heat to medium-high. Yes, you read that right: Don't preheat the pan. You want as much fat to render out as possible, so start with a cool pan. 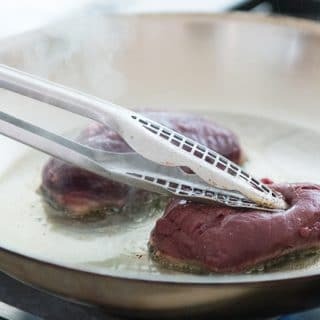 If you are working with normal wild duck breasts, i.e., skinny ones, heat the pan over high heat for 1 minute, then add 2 tablespoons of duck fat, butter or some other oil. Let this get hot, but do not let the fat smoke. Only then do you lay the duck breasts in the pan, skin side down. Either way, once the duck breasts start cooking, you will notice the "tails" of skin and fat from the head and the tail side of the fillet contract immediately. As the skin contracts, you will sometimes get a little oval patch on the tail end of the breast that curls up and doesn't make contact with the pan. Use your tongs to press down on this part for 30 to 60 seconds. This gives you a more even sear. STEP THREE: Let the pan do its job. Cook at a jocular sizzle -- not an inferno, not a gurgle. Think about how bacon sounds in the pan when you cook it, and you have the right idea. How long? It depends. I like my duck medium-to-medium-rare. To do this with small ducks like teal or ruddy ducks, you need only about 3 minutes on the skin side, and you might want to keep the heat higher. Medium-sized ducks like wigeon, gadwall or wood ducks need 3 to 5 minutes. Mallards, pintail, canvasbacks and domestic ducks need between 5 and 8 minutes. If you are cooking a goose breast, you will want the heat on medium-low and you'll need to cook the skin side a solid 10 to 12 minutes. The key is to let the breast do most of its cooking on this side -- it's the flattest, and will give you that fabulously crispy skin we all know and love. Again, I repeat: When you cook a duck breast, 3/4 of the total cooking time is on the skin side. STEP FOUR: Turn the breasts over. When? Follow the guidelines above, but also use your ears: You will hear the sizzle change; it will die down, just a bit. That's when you turn. Now -- this is important -- lightly salt the now-exposed skin immediately. Doing this seems to absorb any extra oil and definitely gives you an even yummier, crispier skin. Let the ducks cook on the meat side for less time. I recommend: 1 to 2 minutes for small ducks; 3 to 4 minutes for medium ducks; 4 to 6 minutes for large wild ducks and domestic duck; 5 to 7 minutes for geese. More than mere time, however, you need to just use The Force to know when your duck is ready. Not in tune with The Force? The next best thing is the finger test for doneness. Use this to determine when you're almost ready. My advice is to go to the next step when your duck breasts are rare. STEP FIVE: Now "Kiss" the thick side of the breasts by standing two halves against each other. 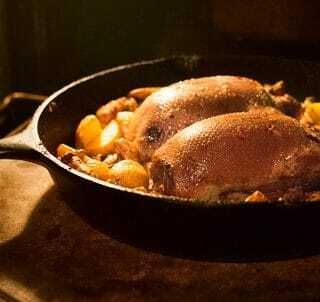 You will notice that duck and goose breasts plump up and contract as they cook. One side of the fillet will be wider than the other, and this side will need some heat. You can see the wider side in the picture. Just tip the breasts on their sides and cook for 30 to 90 seconds, just to get some good color. STEP SIX: Take the duck off the heat and let it rest on a cutting board, skin side up. Teal need only need a minute or two rest, while big Canada geese might need 10 minutes. Everything else benefits from about a 5 minute rest. A duck breast is just like a steak: If you don't rest it, the juices will run all over your cutting board -- and not down your chin, where they should be. You can slice the breast from either end, either side up. You can get thinner slices by starting at the meat end, but you lose a little of the crispiness of the skin. If you are serving a whole breast, always serve it skin side up, with its sauce underneath. That’s it. This may sound like a long process, but it all comes together in a few minutes, once you start cooking. Still a little foggy on things? Here is a video I did on how to cook a duck breast. Discover more tips, tricks and recipes for cooking all kinds of ducks and geese, wild or farmed. Jim: Yes, typically they are skinned, but either way works. Thanks for the detail on cook times. We did brine the breasts for a few hours prior but being new to duck hunting not sure of the difference it made, regardless it came out fantastic. Unfortunately for mallards they are now on the menu. Made it this evening. Followed your instructions to the T!! Huge success…. could not have been better. Our Christmas Eve dinner for 4 was wonderful. Followed your directions for our first-time experience with breast of duck purchased from local grocery (Jungle Jim’s in Eastgate). Pan-seared with only some added tarragon for seasoning. Delicious! And the velvety gravy I made from the pan scrapings was the BEST I EVER MADE! No doubt, the sherry added to the tarragon-infused gravy was the secret. Thank you! We’ll do this again!